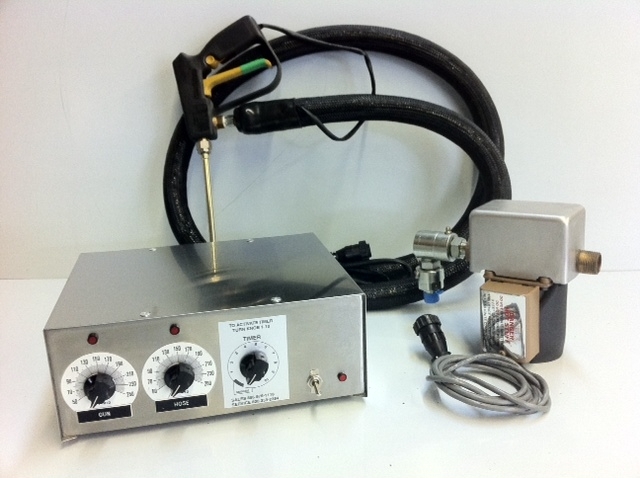 THE EZ WAX DISPENSING SYSTEM is designed for filling containers or molds. Easy to use and operate with paraffin and similar viscosity waxes. Temperature ranges from 135 to 195 degrees Fahrenheit. The innovative design, exclusively a Rite-Hete product that is manufactured on-site in our factory, allows for fast filling. Fill 12 oz. jars in 6 seconds! Order your system today! LIGHTWEIGHT HEATED TEFLON HANDGUN: Designed with the candle maker in mind, the heated handgun is rugged, durable and completely heated for stop-and-go pouring. 6-INCH EXTENSION NOZZLE: Ideal for pouring into deep glass jars. 8 FOOT HEATED TEFLON STEEL-BRAID HOSE: Designed with rugged construction, the flexibility of this braiding, combined with the inherent flexibility of the Teflon core, produces exceptional construction to withstand even the strongest colors and scents. The smooth bore Teflon core also provides for easy cleaning with very little residue from previous colors and scents. Purge out the last color and scent fast! Estimated waste per batch is approximately 3 ounces. No mess or time delay in color change. Includes its own thermostat control and a swivel for easy management. The system connects to the ¾” ball valve on your melting tank. The ideal system is matched with our VRS Direct Heat Melters. Our VRS tanks are high-end commercial fast melt tanks, ideal for mixing your color and scent directly into the tank. Place the complete system on a rolling cart and you have a fast portable filling system. * Must have the viscosity of water when melted. See our EZ Gel Filling System for higher viscosity applications such as Gel for lower temperature material filling.